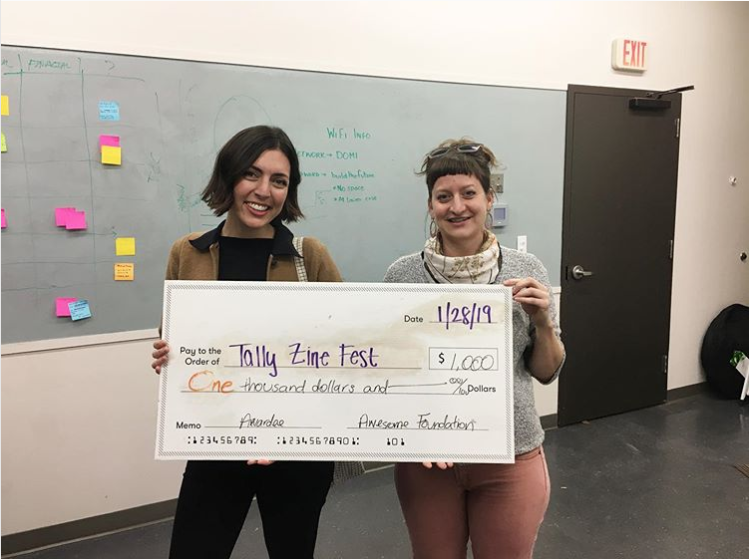 FSU MFA and Alumni organized Tally Zine Fest was recently awarded a grant from The Awesome Foundation! This award will allow the organization continue to enrich the Tallahassee arts culture and create newfound relationships among makers. Tallahassee Zine Fest is an all inclusive festival allowing the Tallahassee community to showcase self published books and a variety of other types of printed matter. The organization offers year round workshops to further educate people about self-publication and how to make zines. TZF is a platform for the DIY community and merges locals, academics, and anyone interested in printed media. TZF was started in 2018 and is set for its second year with over 30 participants, lots of volunteers, and a small board of directors. It is constantly adapting and growing to fit the needs of the Tallahassee and national zine community. Big things are happening. This year’s fest will be on February 23rd, 12-6 pm, at The Bark– find them on Facebook! 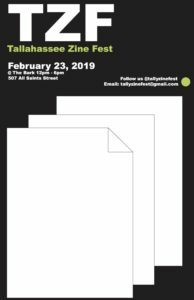 Tallahassee Zine Fest is organized by current MFA candidates: Colleen Itani and Kelly Lorraine Hendrickson and FSU alumni: Hope Riffee and Alexa Turnbull.